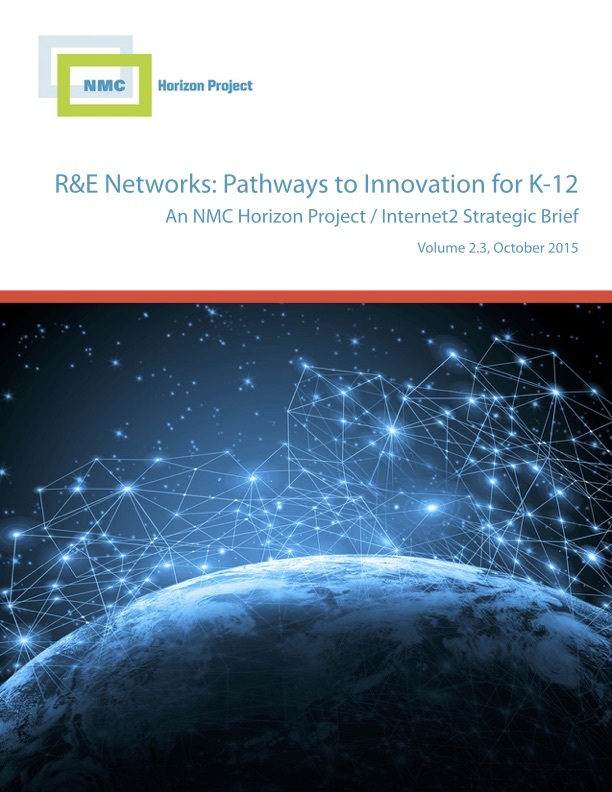 The purpose of this NMC Horizon Project Strategic Brief, R&E Networks: Pathways to Innovation for K-12, is to assist the K-12 community and policymakers in advocating for high-quality, high-capacity, and affordable broadband connections to every classroom in the United States. It reflects the results of a May 2015 convening of national educational technology experts on the issue of high-speed networking in K-12 education. In their discussions, a panel of experts representing a range of leadership roles across the US K-12 education system identified trends within and beyond schools that are currently — and have the potential to be — enabled and constrained not just by inadequate bandwidth, but also by a lack of connectivity to potentially transformative Research and Education (R&E) networks. The report also presents a set of recommendations to K-12 leaders regarding the integration of R&E networks. Mardis, M.A. (2015). R&E Networks: Pathways to Innovation for K-12. An NMC Horizon Project / Internet2 Strategic Brief . Austin, Texas: The New Media Consortium. (Volume 2.3, October 2015). Retrieved April 20, 2019 from https://www.learntechlib.org/p/182094/.